[Written by Bill Reaves and published in ‘The Coastal Carolinian’ on September 9, 1982. This new bus station was located at Lake Park Avenue North and Raleigh Avenue in what is now the BB&T Bank building. 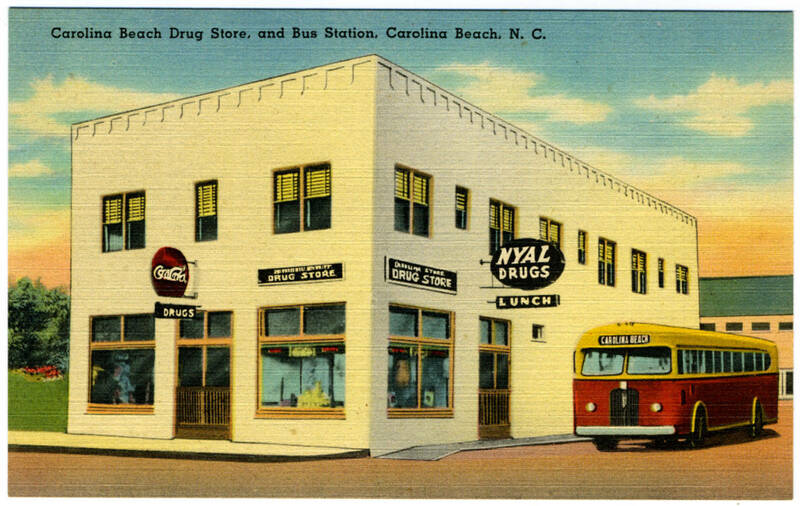 The original bus station operated during the early 1940s in Hall’s Drug store, currently the Laney Real Estate building]. “Carolina Beach’s new ultra-modem bus terminal opened to the public for the first time at 6 pm. on Friday, July 30, 1948. The formal opening included a large number of state, city and county officials, plus many bus line representatives. The Queen City Coach Company free soft drinks, nabs and ice cream. The radio station WGNI covered the festivities by a “remote broadcast” for minutes. 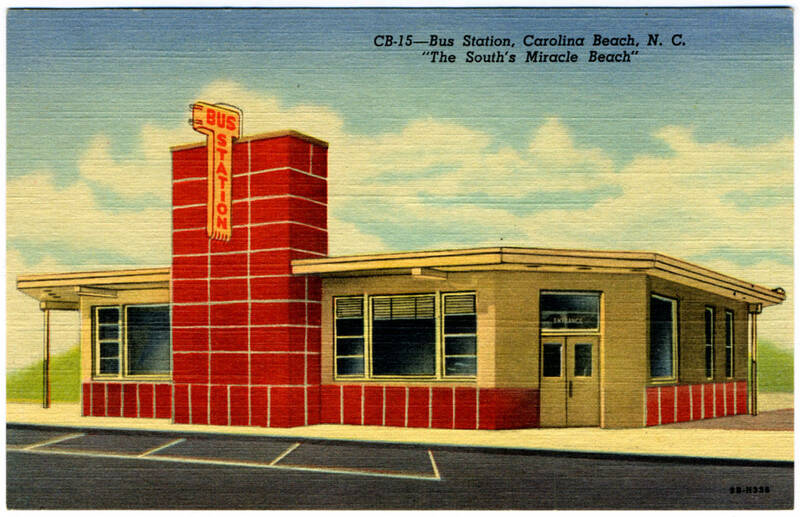 Construction of the station took more than a year, after the announcement on May 14, 1947, that “Carolina Beach’s dream was to come true” after the resort’s long fight for a bus station there. Hal J. Love, local manager of the Queen City Coach Company at Wilmington, made the announcement. The long delay was caused by the Civilian Product Administration holding up the construction permit. Material shortages were still a problem following World War II. 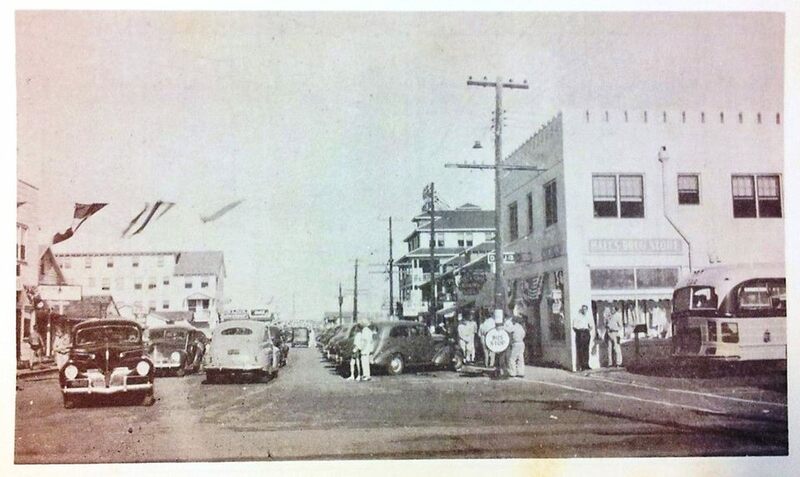 The building was 60 by 44 feet in size and was surrounded by a spacious loading and unloading platform. The waiting room was 32 by 22 feet and was equipped with three sets of comfortable benches in the latest style. In the waiting room was the ticket office, baggage checking room, telephone booths and rest rooms. Another waiting room, 22 by 20 feet in size, with rest rooms, was provided for the “colored.” The soda shop, with a modern fountain, a sandwich bar, and a “Hot Point” kitchen, plus a gift and magazine counter, was well lighted with large plate glass windows and the very latest designed fluorescent electrical light fixtures. The terminal was to be well heated during the winter months by a Bryant heating system. Guests for the formal opening included Carolina Beach Mayor A.P. Peay and the following members of the local board of aldermen: Thomas A. Croom, William L. Farmer, W.H. Shinn and Glenn Tucker; also Mrs. Alice Strickland, town clerk; Mrs. Julia M. Helms, assistant town clerk; Police Chief Bruce Valentine; Fire Chief Jim Bame; R.G. Barr, secretary of the Chamber of Commerce; Emmett H. Bellamy, attorney for the town; and local Queen City Bus Agent Adams, Carolina Beach druggist. Other guests included Kure Beach Mayor Lawrence C. Kure, Wilmington Mayor E.L. White, New Hanover County Board of Commissioners Chairman, Addison Hewlett, and many, many more. Also invited were: H.E. Livingston, of the Wilmington, Brunswick and Southport bus line; R S. Pullen, of the Pullen bus lines, of Burgaw; Charles Hall, president of the Seashore Transportation Company; R.C. Hofiinan, president of the Carolina Coach Company, of Raleigh; D.D. McAfee, district superintendent of the Atlantic Greyhound Bus Lines, of Raleigh; and George Pullen, Fayetteville attorney.